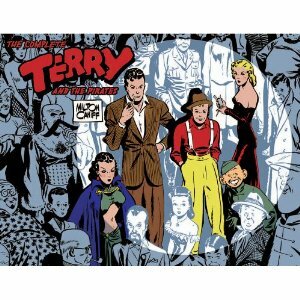 Terry and the Pirates was an action-adventure comic strip created by cartoonist Milton Caniff. The daily strip began October 22, 1934, with the Sunday color pages beginning December 9, 1934. Initially, the storylines of the daily strips and Sunday pages were different, but on August 26, 1936 they merged into a single storyline. Although Terry and the Pirates had made Caniff famous, the strip was owned by the syndicate, which was not uncommon at the time. Seeking creative control of his own work, Caniff left the strip in 1946, his last Terry strip being published on December 29. After Caniff's departure, Terry and the Pirates was assigned to Associated Press artist George Wunder. Wunder drew highly detailed panels, but some critics, notably Maurice Horn, claimed that it was sometimes difficult to tell one character from another and that his work lacked Caniff's essential humor. Nevertheless, he kept the strip going for 27 years until its discontinuation on February 25, 1973, by which time Terry had become a full-grown man and reached the rank of Colonel. The adventure begins with young Terry Lee, "a wide-awake American boy," arriving in contemporary China with his friend, two-fisted journalist Pat Ryan. Seeking a lost gold mine they meet George Webster "Connie" Confucius, interpreter and local guide. Initially, crudely drawn backgrounds and stereotypical characters surrounded Terry as he matched wits with pirates and various other villains. He developed an ever larger circle of friends and enemies, including Big Stoop, Captain Judas, Cheery Blaze, Chopstick Joe, Cue Ball and Dude Hennick. Most notable of all was the famed femme fatale, the Dragon Lady, who started as an enemy and later, during the war, became an ally. Caniff included a number of non-American women who fought the heroes and had the funny habit of referring to themselves in the third person. These included the Dragon Lady herself and crooks and spies like Sanjak and Rouge. In a rather bold move for a 1940s comic strip, Sanjak was hinted at being a lesbian and cross-dresser with designs on Terry's girlfriend April Kane. Affably Evil: Cap'n Blaze. He may be a warlord, but he is a jolly old soul who enjoys a game of checkers with his captives. All Amazons Want Hercules: Implied to be a major factor in the Dragon Lady's desire for Pat Ryan. Artifact Title: Although pirates continue to appear throughout the run of the strip, the title "Terry AND the Pirates" doesn't really apply after the first arc. Bad Habits: Cap'n Blaze and his gang set up an opium farm in a monastery and disguise themselves as monks. Bedsheet Ladder: Nasty (with some help from Burma) uses to one to escape from Hunter Yurk's compound. Cat Fight: The only arc to feature both Burma and Dragon Lady naturally featured a cat fight between the two of them. The Chanteuse: This was Burma's original career. Cut the Fuse: The Dragon Lady shoots through the fuse of an explosive that has been stuffed in Connie's mouth! Desk Jockey: Terry gets a speech from his commanding officer just after he gets his flight status which includes him stressing him treating the US Army's bureaucracy with respect. Disguised Hostage Gambit: Having captured Pat Ryan, Klang dresses him a Japanese uniform, gags him and ties him to a post so he looks like a sentry in the fake camp the Dragon Lady is about to attack. Hypnotize the Princess: Sanjak does this to April Kane. Les Collaborateurs: Several villains were only too willing to collaborate with the Japanese invaders; most notably Warlord Klang. Hotshot Charlie: "I yield to no one in my appreciation of Oriental art, but there is a small segment of my mind which I reserve for the well-being of Charles C. Charles - Hotshot Charlie to the multitudes - and at the moment I feel myself somewhat depressed about his future." The Nicknamer: The Dragon Lady refers to almost everyone by a title that is "'something' one". Pat Ryan is 'handsome one'; Terry Lee is 'youthful one', etc. Repetitive Name: Charles C. Charles, a.k.a. Hotshot Charlie. Rewarded as a Traitor Deserves: Klang does this to a defector from the Dragon Lady's forces. After the defector has allowed Klang's forces to slip past his guard post, he is rewarded with a bayonet through the chest. Sdrawkcab Name: The Dragon Lady sometimes used the alias Miss Nogard. Second Sino-Japanese War: Many strips in the late 30s had the heroes fighting the Japanese (just refered to as 'the invaders' prior to Pearl Harbor because of the strip's isolationist editor). The Dragon Lady even gives up piracy to become a freedom fighter. The Speechless: Big Stoop. The Dragon Lady had his tongue torn out when they were children. Spoiled Brat: Nastalathia Smythe-Heatherstone, a.k.a. Nasty. Third Person Person: Dragon Lady, Sanjak, Rouge, Klang... The list goes on and on. This Is My Name on Foreign: The thug Weazel goes by the name Belette (French for 'weasel') while working for Baron de Plexus. Villainesses Want Heroes: The Dragon Lady wants Pat Ryan. Whip It Good: The whip was Papa Pyzon's weapon of choice. Wronski Feint: Dude Hennick pulls one a Japanese fighter when the heroes are escaping from Temple Rock prison, causing the fighter to crash into a lake. This page was last edited on 11 November 2015, at 06:08.